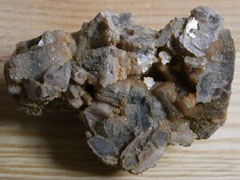 Lepidolite mica usually occurs as massive, fine grained material which can be used for ornamental purposes. Crystals can be found and these can be cut into gemstones for collectors. Chemical composition: Complex aluminosilicate of aluminium, potassium and lithium, with fluorine and hydroxyl. Lepidolite is the junkie’s friend.Its high lithium content is an excellent balancer allowing a gentle withdrawal from compulsive behaviour. Gently eases intensity of feelings, stress, mood swings, depression, manic-depression, self-criticism, anxiety, addictions and worrying. Brings hope, relief, gentleness, self-love, patience, self-forgiveness, unworried sleep, mental / emotional balance, and well being. Helps muscles, strengthens heart, beneficially influences blood, glands and immune system, skin. High lithium content aids emotional, mental balance and stability, aids sleep, enhances expression of one’s inner light and joy. Balances brow chakra with new spiritual love. Lepidolite is associated with the star sign Libra. Lepidolite is an all rounder but acts mainly on Sahasrara, the Crown Chakra ( 7 ), Anahata, the Heart Chakra ( 4 ) and Muladhara - the Root Chakra ( 1 ).